Stunning bride Janelle got married at the lavish private Villa Captiva here in Cabo this May. She was very pleased with her Suzanne Morel experience, and she shared a few of her flawless photos to show just how perfect she looked on her wedding day! Janelle’s beach wedding make-up was on the natural side, which always looks best in outdoor photos in sunny Los Cabos. We gave her well-defined lashes and a bit of blush to sculpt the cheeks. A light pink lip completed this pretty, romantic look. Her hair was done in an intricate up-do with a side part and perfectly sideswept bangs. 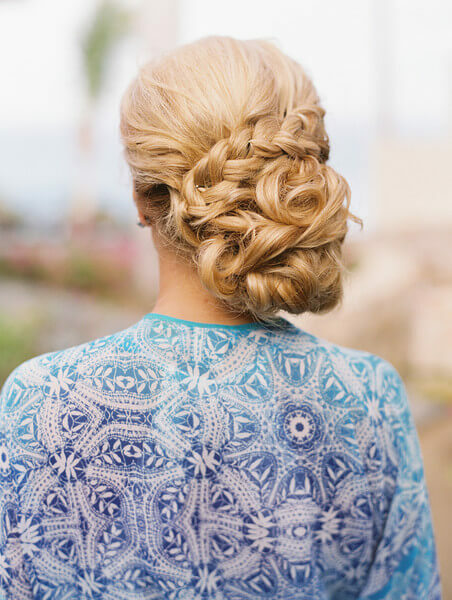 We loved the thick braid and all the texture of this lovely bride’s hairstyle! This entry was posted in Cabo Bridal Hair and Makeup and tagged beach wedding hair, beach wedding updo, best bridal hair and makeup in Cabo, bridal salon Cabo, bridal style in Los Cabos, Cabo bridal hair, Cabo bridal makeup, Cabo private villa wedding, Cabo wedding hair, Cabo wedding makeup, destination wedding hair, destination wedding makeup, Lane Dittoe photography, romantic wedding makeup, Suzanne Morel review, Suzanne Morel salon, Villa Captiva Cabo, wedding braid updo.